In August I put out the same picture in watercolours. I wasn’t that happy with it and I wondered if it would be better done in pastels. 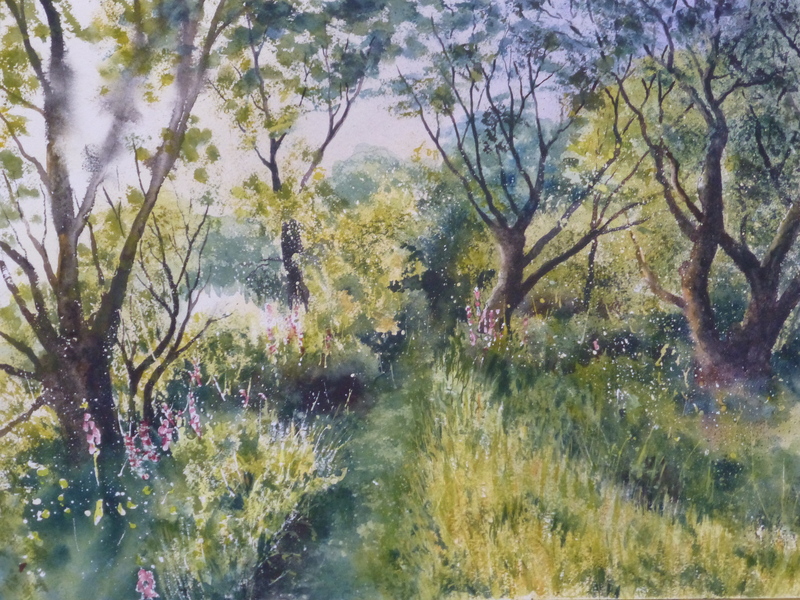 So here it is and now when I compare there are improvements, but I have lost the lighting I achieved with the watercolour and I also made more of a feature of the foxgloves. Maybe that’s something I might do later to this painting. This is the third painting from my trip up Parbold Hill in early July when the weather was good. The low light of the evening sun pushing through the contorted trees attracted me and the splashes of red from the drifts of foxgloves gave some complementary colour. It made for a productive trip even though I didn’t quite get the view of the churches I was after. I wrote in my previous blog about going up Parbold Hill in Lancashire looking for a view of these churches and the plain beyond. I found this spot after a bit of searching having already done a painting. You get this view coming along the road which runs on the left of this painting between the trees and the nearest church. I think the trees, with their foliage, take a bit away from the scene and block off some interesting detail. It may have been in the late autumn or winter when I have come down the road and glimpsed the view from the car and this is the scene I remember. I need to return later in the year and have another look. But having said that, it’s still not a bad view. The other night I went up to Parbold Hill which gives views across the Lancashire Plain. I wanted to paint the churches on the hill in the evening light. 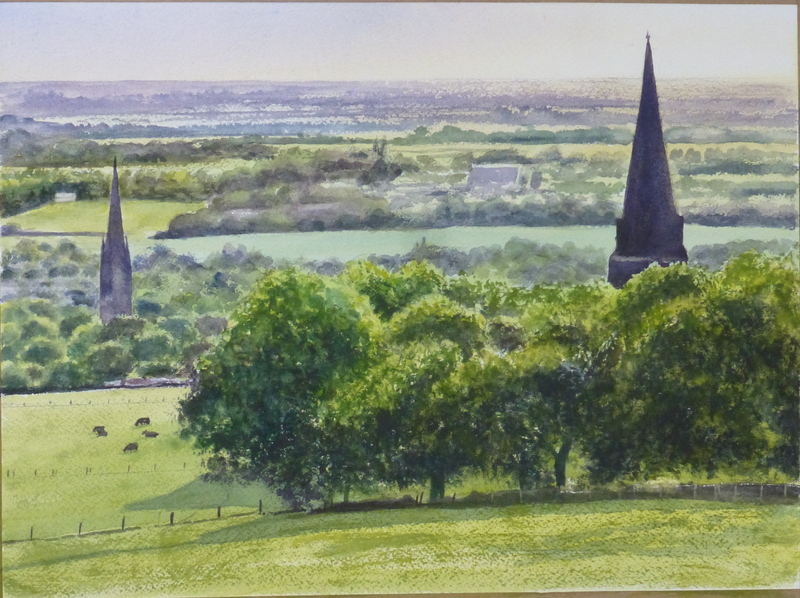 I couldn’t find the view I was after, but I cut my losses and did a watercolour sketch looking down from the right hand side of this painting. 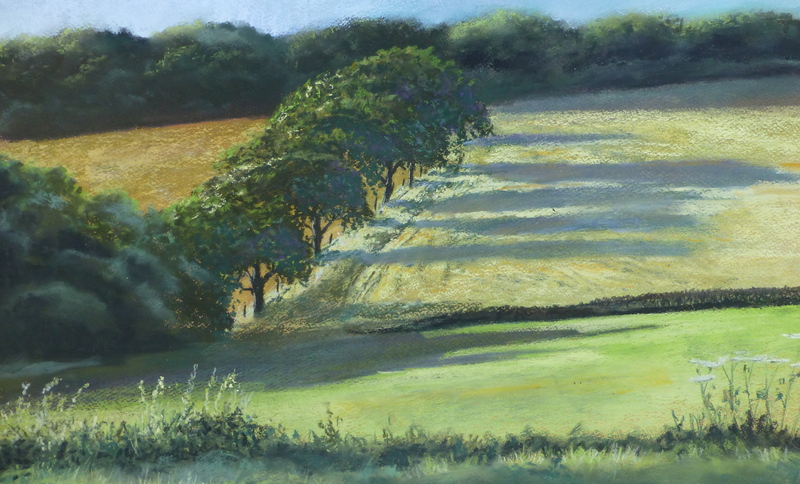 This row of trees attracted me as I sketched and after I had completed it I walked around seeing if there were some alternative views and saw the shadows the trees were casting up the hill and the light on the top of the branches. For this painting I have isolated the trees, cutting a fair few down in the name of composition. That evening I then went on walking and found a view of the churches I was after. Sod’s law. Anyway I took a few photos and came home. There was a time when I would have continued searching rather than getting on with some painting, but on too many occasions I have finished with nothing or started so late I didn’t have time to complete and finished up rushing it. Anyway, it was a lovely summer’s evening.